Firmware build 1799+: For basic Quadstick + PS4 applications, the CronusMax is no longer required for uninterrupted "full-crossover" type support. 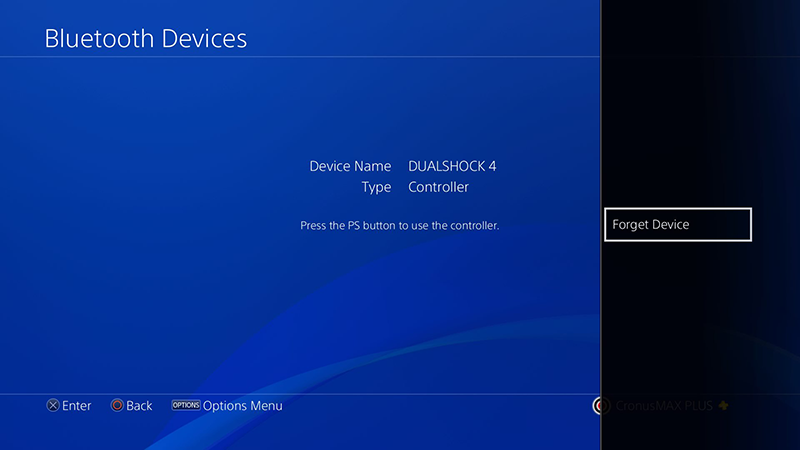 Simply update the firmware in the Quadstick to build 1799 or later, plug the Dual Shock 4 (DS4) into the USB A port on the back of the Quadstick, and enable "Enable Boot in PS4 USB mode" in the Quadstick Manager Program miscellaneous settings tab and "Save Preference to Quadstick". Direct PS4 support has been available since build 1242 that was similar to the CronusMax "partial-crossover" support, where the connection is interrupted periodically. Some games react poorly to the interruption. Because of this, a CronusMax Plus running in a "full-crossover" configuration was still recommended. This firmware update eliminates that need. The "touch" output presses the touchpad and is probably all that is normally needed. The directional outputs allow the position of the touch to be controlled. See the configuration spreadsheet PS4 Full Crossover Default for an example. The user has the option of not connecting the DS4 to USB A and operating in partial-crossover if a second player needs to use the DS4. The Quadstick will need to be unplugged and plugged back in to the PS4 again if the DS4 is removed after power is applied. If the DS4 is plugged into the USB A port after power up, and the system is in partial-crossover mode, it will switch to full-crossover when the next interruption timeout occurs. When the DS4 is being used with the USB A port, do not turn it on. Use the front panel button to start the PS4. The DS4 will appear to be off, but will be providing a stream of data to the Quadstick. If the PS4 stops responding to the Quadstick, perform the following procedures with the Dual Shock 4 controller. 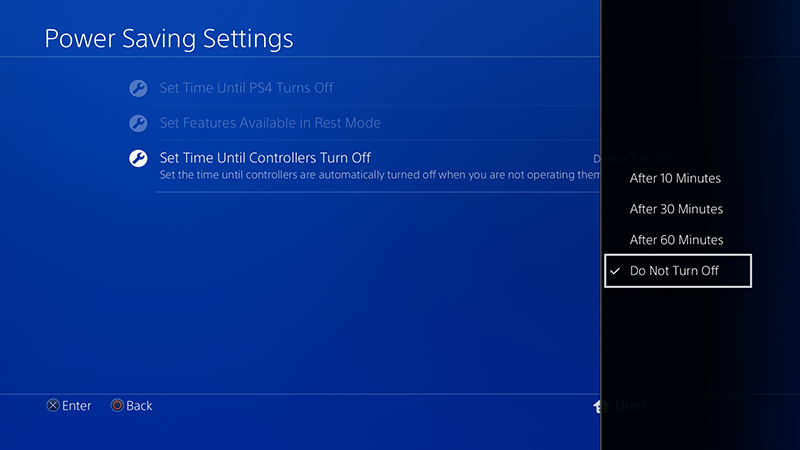 With the DS4 connected to the PS4 and turned on, go into the Power Saving Settings and disable the Power Saving feature that turns off the controller if it is idle. 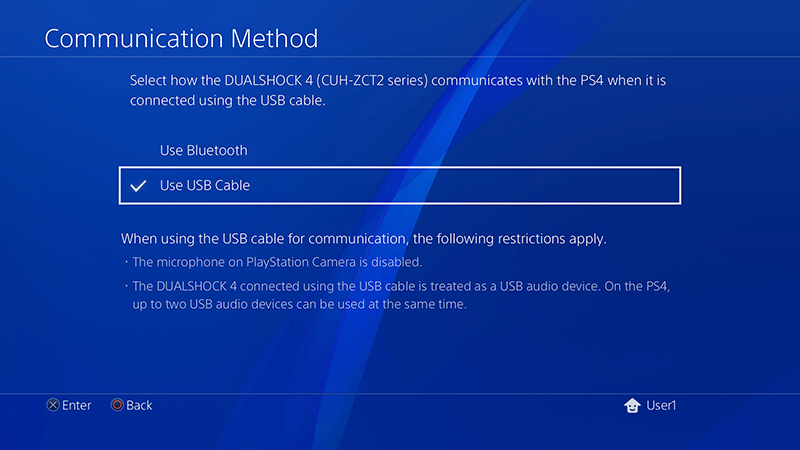 With the DS4 connected to the PS4 and turned on, change the Communication Method to "Use USB Cable" if the controller is a Version 2 controller. Older systems may not have this feature. Turn off the PS4, then turn it back on from the FRONT PANEL, not the DS4. Then plug the DS4 into the back of the Quadstick and then plug the Quadstick into the PS4. Do not turn on the DS4 or touch any button on it. When the Quadstick first powers up, there may be a slowly varying dim yellow light from the DS4 as it is charging. Once charged, the DS4 should not have any lights on. 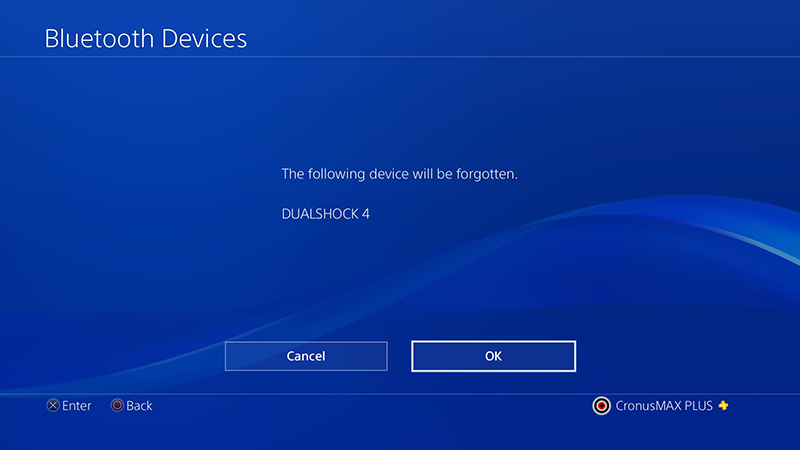 If the DS4 is connected to the PS4 for any reason, the Bluetooth connection may need to be deleted again.